Can you really make beef tenderloin on your Foreman Grill? The answer is most definitely, yes! Beef Tenderloin (filet mignon) is often considered to be the king of steaks, the best cut, the most tender and juicy. It’s very lean and often has just enough fat marbled in to give it its tenderness and wonderful flavor. Filet Mignon steaks can be very expensive when purchased in restaurants, but when purchased at your local supermarket or butcher and prepared at home, it is considerably less expensive and is quite easy to make. 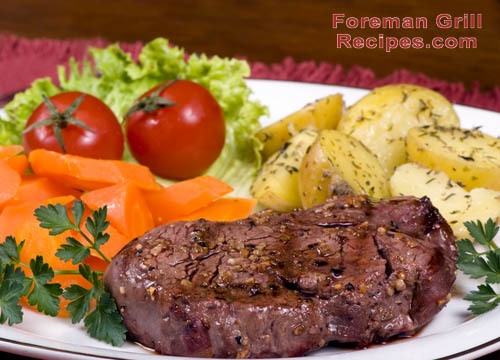 Let’s look at how to make a delicious filet mignon steak of your very own right at home on your Foreman Grill. Size of steaks varies but generally they are found 1 -2 inches thick and at 4oz-8oz each. For the purpose of using your George Foreman Grill, or any other indoor press grill, you’re going to want to get smaller size steaks. In fact, if you are able to purchase filet mignon medallions, all the better. For the purpose of this recipe, let’s go with a steak right in the average size of about 1.5″ thick and about 6oz. Preheat your Foreman Grill with the lid closed for at least 5 minutes. Use the highest temp setting if you have one. This is important! You want the grill to be as hot as possible when cooking your steak. Butterfly cut the steak. This is the process of slicing it in half thickness wise, essentially making 2 steaks of approximately 3/4″ thick. When slicing, don’t go all the way through. At the end of the slice leave just enough so that the steak holds together and opens up flat, like a butterfly. Combine all ingredients in a shallow dish and make sure steak it coated well. You can pierce the steak with a fork a few times to help the ingredients penetrate. If you’re able to do this step a few hours ahead of time and let sit in the fridge to marinate – even better. Place steak on the grill and close lid. Leave it alone for at least 4 minutes. Cooking times will vary but will generally be 4-7 minutes for rare, 6-9 minutes for medium-rare. But always check it after 4 minutes – that’s the magic time when it may be done enough for a good rare steak. If desired, rotate the steak a 1/4 turn halfway through the grilling process to get those nice crisscross grill marks.